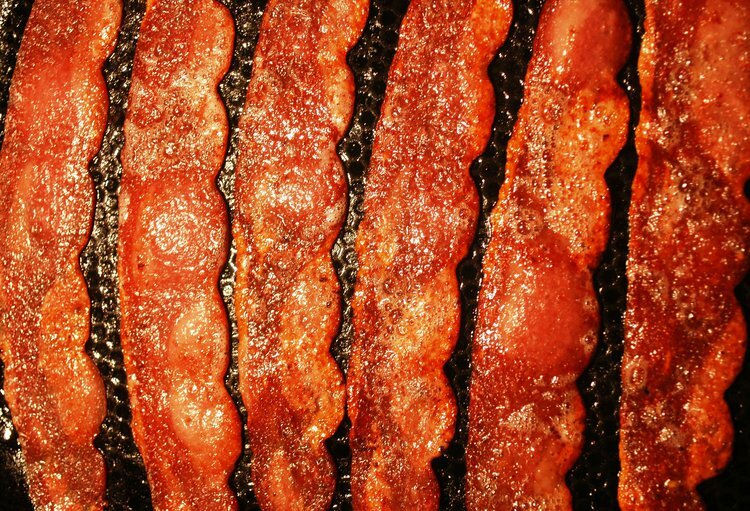 How Does Bacon Negatively Impact Your Health? About 68% of a slice of pork bacon contain calories from fat, about half of these calories are from saturated fat. Saturated fat should be significantly limited and be no more than 7% of your caloric intake per day. Bacon has become increasingly more popular as restaurants and recipes are now choosing to add the indulgent food to almost anything. Despite its sought out flavor, it can have a substantial impact on your well-being. About 68% of a slice of pork bacon contain calories from fat, and about half of these calories are from saturated fat. Studies suggest that saturated fat should be significantly limited and be no more than 7% of your caloric intake per day. Bacon is part of a family of meats known as processed meat. The American Institute for Cancer Research describes this meat as “preserved by smoking, curing, or salting, or addition of chemical preservatives.” Examples of processed meats include bacon, sausage, ham, hot dogs, and some deli meats. It has been found in a Harvard School of Public Health Study that consuming processed meats is correlated to a 42% increase in the risk for heart disease, as well as a 19% increase in risk for type 2 diabetes. Additionally, the American Institute for Cancer Research has also determined an association between regular consumption of processed meat with an increase in risk for colorectal cancer. In other words, processed meat should be avoided in all cases except special occasions. Bacon intake should be monitored with caution. If you decide to indulge, it should be served in small portions combined with fresh fruits or vegetables. Micha R, Wallace S, Mozaffarian D. Red and Processed Meat Consumption and Risk of Incident Coronary Heart Disease, Stroke, and Diabetes Mellitus: A Systematic Review and Meta-Analysis. Circulation. 2010; 121(21): 2271-2283).